It was a big news when Airtel stated that they are going to launch the 4G LTE service in India very soon at Kolkata. It was covered by the Gadget Chirp too then. And now Airtel is out with an offical Airtel 4G LTE page on the official Airtel website with all the pricing and plans of the Airtel 4G LTE services. Airtel 4G LTE services promises the speed of 40Mbps. 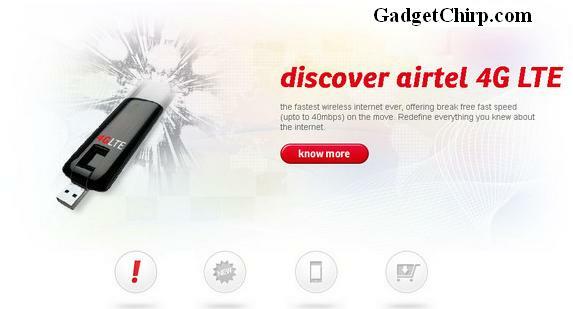 Airtel 4G LTE service will be available from the 4G USB Modem. To use the Airtel 4G LTE services, you will have to get a new number to use in the USB Modem. You will get the 6GB at Rs. 999 per month and 18GB at Rs. 1999 per month. These Airtel 4G LTE plans will be available on both prepaid and postpaid. As announced earlier, Airtel 4G LTE service will be first launched to Kolkata and after that it will be available in Banglore soon after that. Let's see what will be the response of the users as the 3G services are still not hit in India yet.